“Woodcraft Magazine” editors have compiled copy from previous magazine issues into two new books designed to help woodworkers set up an efficient shop and equip it with storage. Two new books from the editors of "Woodcraft Magazine" guide woodworkers through the setup of a home shop and then offer projects designed to provide a variety of shop storage solutions. What we offer in ‘Home Workshop Setup’ is a comprehensive approach for helping woodworkers assemble a hardworking shop space. ‘Home Workshop Storage’ offers 21 shop storage projects to build. “Woodcraft Magazine” has released two new books to help woodworkers set up an efficient workshop and then select from nearly two dozen projects to outfit it with ample storage. Woodcraft Supply, LLC, is the magazine’s parent company. “The next book in this series will feature home workshop jigs and fixtures that make your tools work harder, safer, better. Here, you’ll find projects like the multi-featured drill-press table and tablesaw cutoff sled,” Harrold said. “After that we will showcase America’s top shops – examples of how other woodworkers have successfully designed and fleshed out their workshops. We will include a few shops that we designed to provide you with even further guidance.” Schiffer Publishing, Ltd., headquartered in Atglen, Pennsylvania, publishes the “Woodcraft Magazine” books. In addition to its book series, “Woodcraft Magazine” publishes six issues a year and maintains two lines of woodworking plans – Classic® Project Plans and Classic® Shop Plans. Magazine project and technique downloads are also available online. To learn more about “Woodcraft Magazine,” visit http://www.woodcraftmagazine.com and http://www.facebook.com/woodcraftmagazine. To order the two books or for more information about Woodcraft, please contact the store nearest you, visit http://www.woodcraft.com or call (800) 535-4482. 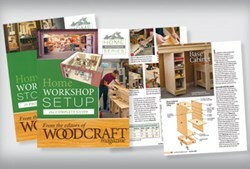 To learn about Woodcraft franchise opportunities, visit http://www.woodcraftfranchise.com or email woodcraftfranchise(at)woodcraft(dot)com.